While administration officials project an economic catastrophe if the debt limit is not raised by Aug. 2, many Americans do not see this deadline as a major problem. 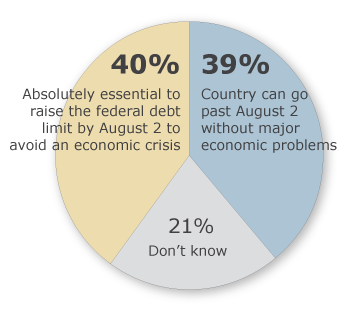 Four-in-ten (40%) say that, from what they’ve read and heard, it is absolutely essential that the federal debt limit be raised by Aug. 2 to avoid an economic crisis, while about as many (39%) say the country can go past this date without major economic problems. By a 53% to 30% margin, most Republicans say that it will not be a major problem if the debt ceiling is not raised by Aug. 2. The balance of opinion is the reverse among Democrats: 56% say it is absolutely essential to meet that deadline to avoid an economic crisis, 28% say it is not. Independents are more divided, though a slim 43% plurality say the country can go past Aug. 2 without major economic problems, while 32% say it is essential to raise the debt limit by this date. The new survey by the Pew Research Center for the People & the Press, conducted July 15-17 among 764 adults, finds that Tea Party Republicans are by far the most unconvinced about the potential fallout from going past the Aug. 2 deadline. 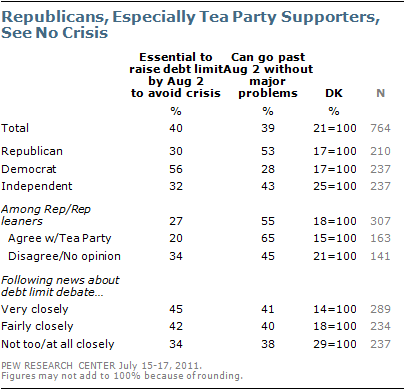 Fully 65% of Republicans and Republican leaning independents who agree with the Tea Party see no major problems if this occurs, compared with 45% of Republicans and Republican leaners who do not agree with the Tea Party. Notably, the degree of attention to this issue has only a modest relationship with peoples’ impressions of the seriousness of the Aug. 2 deadline. Those who are following the issue very closely are divided over whether it is essential to raise the debt limit by Aug. 2 to avoid crisis – 45% say it is essential, 41% say it is not. Those who are following the story less closely also are divided. Most Republicans and GOP leaning independents (59%) who have been following the issue very or fairly closely say the country can go past Aug. 2 without major problems; about the same percentage of Democrats and Democratic leaners (61%) who have been following this issue very or fairly closely say it would be a major crisis.